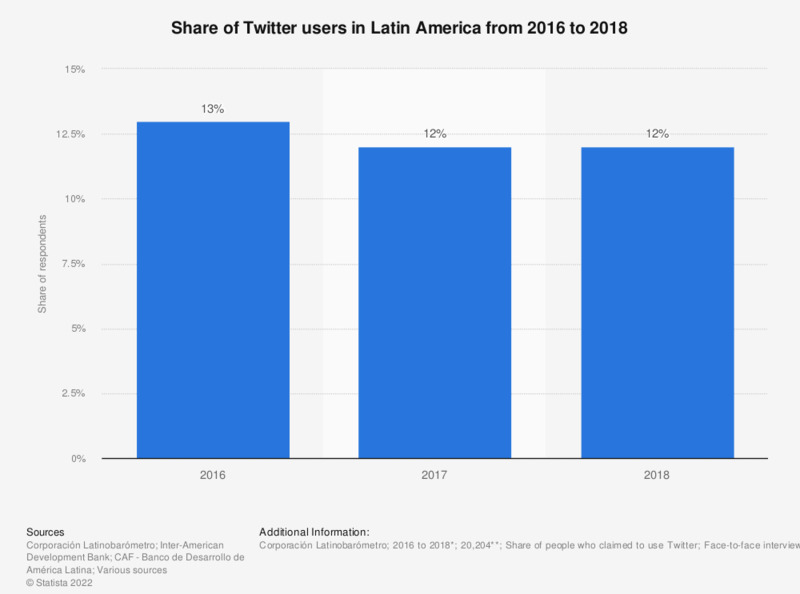 This statistic shows the results of a public opinion survey carried out in Latin America from 2016 to 2018. When asked which online social network they used, approximately 12 percent of respondents in the region claimed to be Twitter users in 2018, same percentage of people as in 2017. * In 2018, the survey took place from June 15 to August 2. ** Number of respondents in 2018. The survey was carried out in 18 countries of the region (Argentina, Bolivia, Brazil, Chile, Colombia, Costa Rica, Dominican Republic, Ecuador, El Salvador, Guatemala, Honduras, Mexico, Nicaragua, Panama, Paraguay, Peru, Uruguay and Venezuela). In each of the countries the number of respondents amounted to between 1,000 and 1,204. The samples were representative for the population of each of the countries.